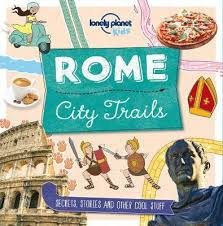 ‘Secrets, stories and other cool stuff’ is what you’ll find in this terrific Lonely Planet Kids guide to City Trails in Rome. There are 19 trails to follow on this journey of discovery for young readers (and older ones too!). Mario and Amelia are the tour guides who set out on adventures along the trails walking in the ‘footsteps of the Ancient Romans’. Parades of triumphs are celebrated. Rivers, fountains, natural surroundings, statues (with odd parts missing), and lots of architecture are looked at. Each area is explored and historical information is shared with light-heartedness and lots of humour (very much like the Horrible Histories). There are countless incredible statistics associated with the sights of each guided trail. These are supported by a mixture of illustrations and pictures that fill each double spread. Looking up, there are things above such as rooftops, domes of churches and palaces, paintings on ceilings, oculi, and shooting stars seen from Pincian Hill. Beneath your feet, well below the ground, are many catacombs, hidden excavations, mummies and burial chambers, and areas where gladiators trained. There is so much for kids to learn while being entertained visually and verbally, even with the grisly side of Rome. There are mysteries and histories, architecture revisited, lots of ruins, and ruined and murdered Emperors to read about. On food trails, there are walks and shops and resting places to choose from. All this is introduced in a vigorous narrative voice by Marco and Amelia who turn up in many scenes as they make their way along the trails, guiding the reader to the many secret places. I loved this page-turner with its plethora of information. It was so easy to read, and never became boring. It is a part of a series of City Trails visited. Check out the list and even if you are not travelling to any of these places, the books are better than having collected volumes of history, as you to learn the backstory of cities and their crazy secrets that wait to be uncovered.